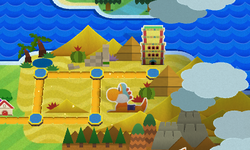 World 2 is the second world in Paper Mario: Sticker Star, located east of Decalburg. The world takes place in the desert (similar to the desert worlds in the Mario platformers, like World 2 from New Super Mario Bros. Wii as well as Dry Dry Desert from Paper Mario), and is the second-shortest world in the game, with only five levels. Before Mario can enter the desert, he must open the door by using some of his stickers as keys. Paragoombas, Pokeys, Spikes, Sombrero Guys, and an Accordion Guy and Maraca Guy are found and only encountered in this world. Kamek is encountered here in a battle again and the Tower Power Pokey is fought here for the second Royal Sticker. However, in order to fight him, Mario must find three tablet pieces to restore the Drybake Stadium, the Pokey's location. While battling atop quicksand and waiting a little time at the Sticker selection, Mario sinks along with the enemies, and get a Game Over automatically. This page was last edited on November 22, 2018, at 11:12.